Waste not, want not. Tork Xpressnap saves more than time at Lord of the Fries. Lord of the Fries is one of the first fast food franchises with a credible vegetarian and environmental agenda. 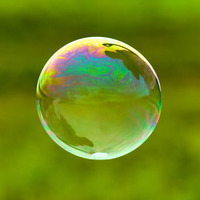 It’s a fresh concept with stores that match its very current, younger profile and customer. Managing Director Sam Koronczyk explains, "Sustainability is a big part of our business. Lord of the Fries is vegetarian for a number of reasons. We also use locally sourced products wherever possible provided taste and quality remain." With a positive culture like that it's no wonder that environmentally responsible Tork Xpressnap dispenser napkins are such a good fit for Lord of the Fries. "We were using standard (dispenser) napkins – people would take bunches and they would end up in the bin. It was a waste of money and an unnecessary waste. And the napkins weren’t recycled." Sam explains, "Tork Xpressnap is more environmentally friendly than what we were using. It’s a better product and has also saved us money." 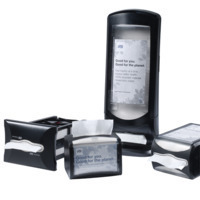 Tork Xpressnap napkins are available in 100% recycled and now locally (AUS) produced FSC certified options, and the dispenser ensures customers take only one napkin at a time reducing consumption and waste. Sam agrees that the choice was a winning one, "We are using a lot less… plus it’s a much nicer napkin to use." 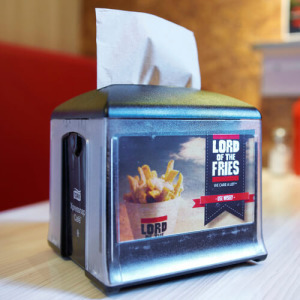 Lord of the Fries are using Tork Xpressnap 100% recycled, bleach-free napkins. Lord of the Fries uses two types of Xpressnap dispensers in all seven store locations – the counter and the tabletop dispensers. There are four dispenser styles to choose from, they're all high capacity and easy to load, saving time and reducing labour. Another feature of Xpressnap is the AD-a-Glance panels which Lord of the Fries use for in-store branding. "We will be using them down the track for our specials and offers. They're good for point-of-sale." says Sam. And now, the new free AD-a-Glance web app makes it even easier by allowing you to create your own panel artwork online. Lord of the Fries plans to open up more franchises in Melbourne and Sydney followed by the rest of Australia. Sam adds "We also have some interest from overseas. We would keep using Tork Xpressnap in these stores."